Here are some of my favourite free juicing recipes. I hope you enjoy them. Don’t forget the great thing about juicing is you can easily adapt and develop recipes to suit your own palette. I hope that these free juicing recipes give you some great juices that might even become some of your favourites too. I think you can’t have too many ideas and recipe combinations when it comes to juicing. As it’s always best to use fruit and vegetables that are in season (for freshness and cost) it encourages you to try out new recipes with things that are readily available to you. This deliciously refreshing juice is perfect for breakfast as it will kick start you into action. If it’s a little tart for your palette add a small amount of sugar or honey to sweeten. Roughly chop the pears and push through your juicer. Slice the grapefruits in half and squeeze the juice from them. Mix both juices together and serve over ice if it’s a sunny morning! This powerful berry drink features blueberries, which provide an excellent source of vitamin C.
This juice couldn’t be simpler to make. 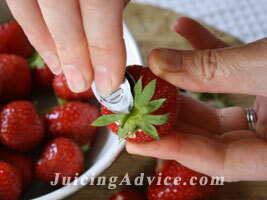 Simply remove all of the berry stalks and pass them through your juicer saving a few for decoration if you wish. Pour over ice, if it’s slightly too tangy for your taste add a little sugar or honey. To get the maximum flavour out of this juice be sure to make it whilst the cherries are in season. This stunning sweet juice really is a treat that’s packed with a rich source of vitamin C.
Remove the stalks from the strawberries and the pips form the cherries. Then pass the strawberries, cherries and grapes through your juicer. Pour into glasses over ice and decorate with slices of strawberries. You should get 2 large glasses of juice. This is a perfect juice for those long hot summer days. The fragrant melon combined with the kick of lime and cool mint provides you with a really refreshing drink. Start by halving the melon and removing all the seeds. Then slice it into wedges and remove the skin. Push half of the melon through your juicer. Next feed the mint leaves into the juicer followed by the rest of the melon. Squeeze the juice out of the limes and stir it into the juice. Serve over ice and add mint leaves for decoration. This juice has a fabulous fusion of apple and fragrant spice providing a refreshing exotic drink. It makes a pleasant change to have a fizzy juice. To get the full flavour from the lemon grass pound it with a rolling pin and make cuts in it, but try to keep it whole. Place this into a jug. 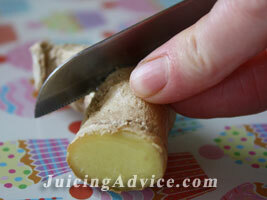 Peel the root ginger and cut into chunks along with the apple. Push both the ginger and the apple through your juicer and add to the jug. If possible leave it in the fridge for an hour to let the flavours infuse. Half fill a couple of glasses with the juice and then top up with sparkling water. This tropical fruit combination will help yours eyes sparkle and your hair shine. It best prepared with really ripe fruit to get the maximum amount of flavour. Slice off the skin of the pineapple taking care to remove any of the “eyes”. Peel the skin off the mango and remove the large pip. Halve the papaya and remove the seeds and skin. Cut all of the fruit into chunks and pass them through your juicer. Pour into glasses with ice and serve immediately. 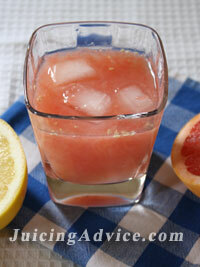 For more free juicing recipes see my vegetable juicing recipes page.